The intensive use of nano-sized titanium dioxide (TiO2) particles in many different applications necessitates studies on their risk assessment as there are still open questions on their safe handling and utilization. For reliable risk assessment, the interaction of TiO2 nanoparticles (NP) with biological systems ideally needs to be investigated using physico-chemically uniform and well-characterized NP. 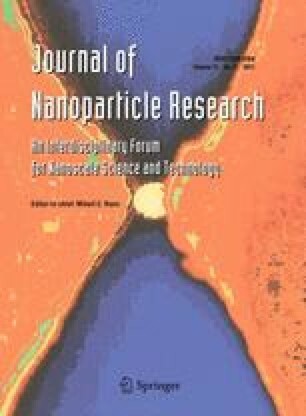 In this article, we describe the reproducible production of TiO2 NP aerosols using spark ignition technology. Because currently no data are available on inhaled NP in the 10–50 nm diameter range, the emphasis was to generate NP as small as 20 nm for inhalation studies in rodents. For anticipated in vivo dosimetry analyses, TiO2 NP were radiolabeled with 48V by proton irradiation of the titanium electrodes of the spark generator. The dissolution rate of the 48V label was about 1% within the first day. The highly concentrated, polydisperse TiO2 NP aerosol (3–6 × 106 cm−3) proved to be constant over several hours in terms of its count median mobility diameter, its geometric standard deviation, and number concentration. Extensive characterization of NP chemical composition, physical structure, morphology, and specific surface area was performed. The originally generated amorphous TiO2 NP were converted into crystalline anatase TiO2 NP by thermal annealing at 950 °C. Both crystalline and amorphous 20-nm TiO2 NP were chain agglomerated/aggregated, consisting of primary particles in the range of 5 nm. Disintegration of the deposited TiO2 NP in lung tissue was not detectable within 24 h.
This study was partially funded by HMGU: EU FP7 projects—NeuroNano (NMP4-SL-2008-214547), ENPRA (NMP4-SL-2009-228789), and InLiveTox (NMP4-SL-2009-228625); UBA-Germany project: Z6 (55 410-31/3); UBern: Swiss National Science Foundation project (310030-120763); and Lund: the Nanometer Structure Consortium at Lund University. The authors express their sincere gratitude to Jürgen Daul and Dr. Achim Kleinrahm, ZAG Zyklotron AG, Karlsruhe, Germany, for their help in proton irradiation of the titanium electrodes.